Keppel can’t get the big shot to fall, and the Huskies win a thriller, earning their third consecutive trip to the State finals. Ribet’s boys will also play for a state title Saturday. ALHAMBRA.–One moment in Tuesday’s Southern Regional final was a fitting microcosm of the entire game, and in many ways, the fortunes of both teams this postseason. 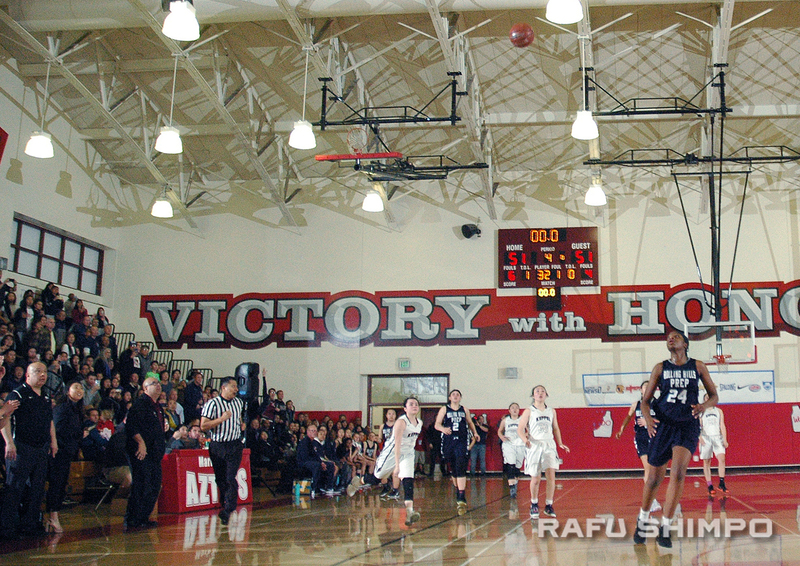 Rolling Hills Prep and Mark Keppel played superb basketball throughout, battling for a trip to the CIF State Div. II championship in Sacramento this Saturday. It all seemed to come down to one play, one heave, that would decide who plays for a trophy, and whose season would come to a disappointing end. With the score tied at 51 and 5.5 seconds left in regulation, Rolling Hills Prep’s Tatum Tamashiro took the inbound pass and immediately found herself swarmed by Keppel defenders. The ball ended up in the hands of Vanessa Aguirre, who time and again in her four years at Keppel has found a way to get the big shot to fall. Her quarterback moon shot sailed from half court, well ahead of the buzzer that reverberated throughout the gym, as open-mouthed players and spectators tracked its flight. It was long enough. It was on target. It reached the backboard and the rim. In overtime, size and strength were the difference for RHP – just barely. Keppel had a flurry of shots in the final nine seconds, including a foul-line floater from Aguirre, that somehow, somehow, just couldn’t find their way through the net. 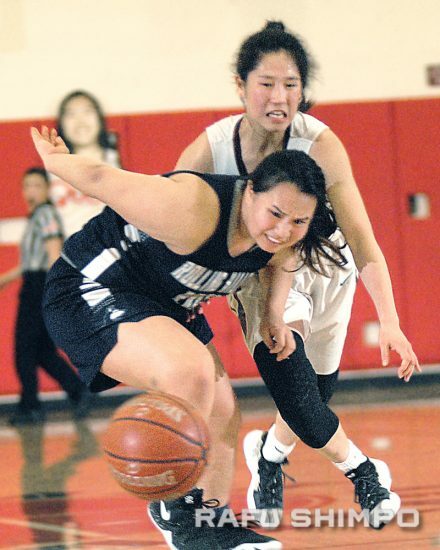 Cassandra Shimada had one last attempt from three-point range, but the ball hadn’t quite left her right hand when time expired, and the Huskies had won yet another one-point game, 54-53. The win gives the Huskies their third straight berth to the State finals. RHP got a game-high 23 points and just as importantly, 20 rebounds from their 6-foot-4 sophomore center, Clarice Akunwafo. “We’ve played against some teams taller than us, and they’ve always had someone that just kills us on the boards,” said Keppel head coach Jose Herrera. The Huskies’ Madison Yamada and Patricia Chung of Keppel battle for the loose ball in a wild fourth quarter. Herrera’s assessment was especially true in overtime. Whereas Keppel’s speed and ball movement kept them in charge for most of the game, RHP’s 22 second-chance points, a 43 to 18 rebound advantage, and dominating in the post at both ends ultimately made the difference in the game. After the Huskies took a 15-12 lead into the second quarter, Keppel’s shooting came to life. Shimada connected on a long three-pointer late in the period to give the Aztecs the lead, and the half ended with Aguirre’s fling beating the buzzer for a 29-24 advantage. However, Rolling Hills Prep has made a career of hanging around within striking distance this season, advancing to this regional final with a one-point comeback win. The Huskies kept the deficit to under six points before Madison Yamada’s three-pointer with just over two and a half minutes in regulation put them ahead. The final two minutes of the fourth was a see-saw battle with the teams trading baskets, but neither able to build a cushion. With RHP in possession and a chance to win the game, Tamashiro, the wily frosh who has filled in remarkably for injured junior forward Macy Pakele, was on the losing end of the turnover that nearly ended the game in Keppel’s favor. Alyssa Maxey went home aching with a bruised ankle after hitting the floor hard with a minute remaining, following a scrum at the offensive end. She finished with five points, three coming on a shot that would prove to be the difference for the Huskies. Maxey received an outlet pass in the left-hand corner and sank the three-pointer that gave RHP a lead they fought valiantly to preserve. Shimada said the plan for those precious final seconds in OT was to get the ball into their most reliable hands. “We have this play that revolves around a shooter, and we were relying on Vanessa to take the shot to win the game,” Shimada explained. “But the defense was too tight and she just had to throw it up. Shimada and fellow senior Aimi Woo said that despite the night’s disappointment, they will leave Keppel with a great deal of pride. “We’re always kind of smaller than other teams, but in practice, we really work hard on conditioning, making sure that we have enough energy and stamina to keep us going throughout the game, and going this far, I’m really proud of this team,” Shimada said. 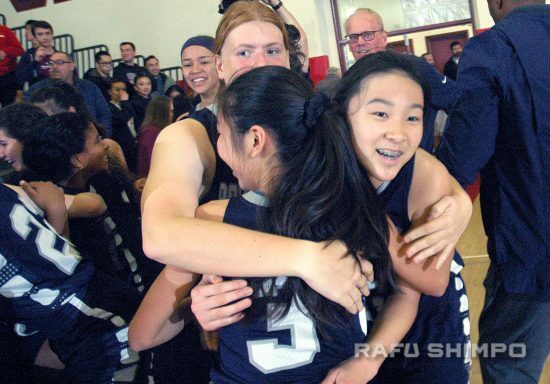 “In varsity sports, it doesn’t matter your age, you do what you can to make the team better, and she’s done that,” a senior teammate said of frosh Tamashiro, getting hugs from teammates Rylie Akahiji (3) and Nicole Millington, after the win. Woo said the excitement of games like Tuesday will be seared into her memory forever. “Of course we wanted to go all the way, but even though I didn’t play much, just being part of this team has been special,” Woo said, holding back tears. Aguirre finished with eight points to cap her brilliant high school career, while junior Patricia Chung led Keppel with 17. Aztecs assistant coach Sydne Kaku said the team will have a very different look next season, after their 10 seniors graduate. The Huskies will face Northern California champion Menlo School for the state title Saturday at 2 p.m., at the Golden 1 Center in Sacramento. Yamada, who finished with six points, said her team’s never-say-die approach has been their mantra all year, especially since losing Pakele for the season to knee surgery. “When we lost Macy, it’s been difficult to start strong at the beginning of each game, but Coach [Richard Masson] reminds us to stay within ourselves and not turn the ball over,” Yamada said. 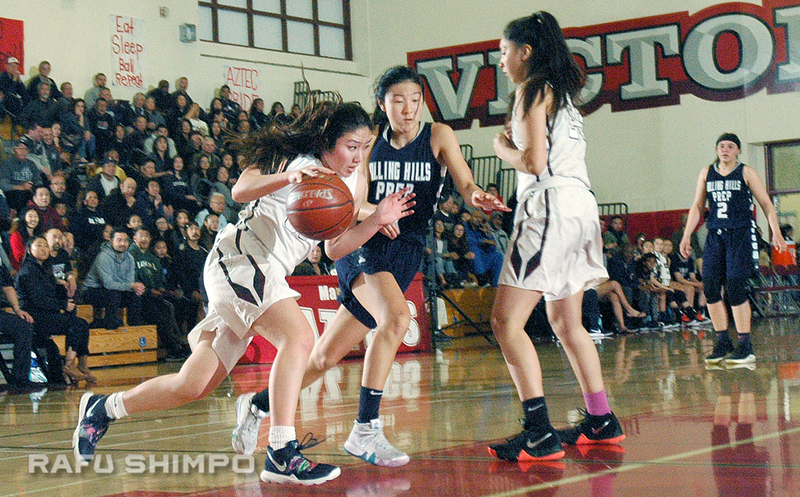 Senior Natalie Valvo had plenty of praise for Tamashiro, the first-year guard who has stepped in to fill some high-scoring shoes. Tamashiro’s efforts have been a key to success this season for the Huskies, who have been forced into a more limited rotation by injuries. Moreover, the season has been unimaginably tough for Yamada, whose father, Scott, passed away suddenly in January. Asked what her dad might say after Tuesday’s wild win, she knew immediately. “That was a close one – way too close,” she said. –Additional information for this story provided by Rafu contributor Timothy Chuman. All eyes are on Vanessa Aguirre’s buzzer-beating heave that very nearly won the game for Keppel at the end of regulation time. Also making the trip to the state capital will be the boys of Ribet Academy. Yuuto Williams and company took care of business early against visiting Silverado, coming away with an 84-64 victory and a trip to the boys’ Div. IV final on Saturday. The Fighting Frogs, who two weeks ago won a CIF Southern Section title, will face Northern Cal regional champ Immanuel in the title game in Sacramento. Ribet went on a 16-2 run to open the game and finished with 10 baskets from three-point range. First-year head coach Reggie Howard told the Victorville Daily Press his plan is to let his players shoot when the have an opening.